Sometimes, we want to challenge ourselves. See just how far we will go to accomplish a task. The challenge : How to make them with only two bowls, a measuring cup, and a whisk as our tools. In other words : the old-fashioned way. Here in America, these confections have quite the reputation : very few folks know how to make them because they just seem HARD. I didn’t even know what went in them, let alone that it was just meringue. 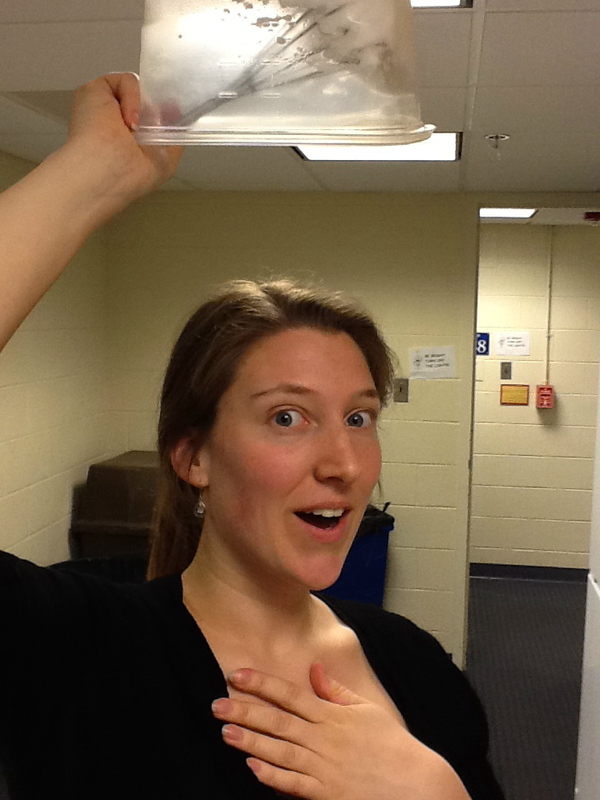 However, with Pauline as my guide, we decided to tackle the classic French cookie. She explained to me that they were in fact simple that she had already made them (successfully) before and that of course we could do it. As we are attempting to whip egg whites by hand and prepare a simple boiled sugar solution, the panicking begins. “We can’t whip the egg whites enough, this is never going to work, they won’t be perfect, we’re a failure…” She may be a little pessimistic but I still love her dearly. Aha. Quite an adventure. However, we survived. Here as a witness, I am going to prove that macarons are really not so scary or difficult to prepare – they just require a lot of optimism and patience and perhaps a little luck. Set these egg whites aside for the moment. In another bowl, mix the almond powder and the powdered sugar. Add the remaining egg whites and stir until well combined. If you want to add vanilla or another flavoring to the mixture, do so now. When complete, set this bowl aside as well. Now we arrive at the complicated step. What is going to happen now is really fun but can be challenging if you are alone in the kitchen (or if you have never worked with molten sugar). We are going to make a basic marshmallow – it’s like “Quick White Icing” for those who are familiar with the classic Joy of Cooking. A sugar syrup will boil on the stove top to a certain point, and it will be then added slowly to the eggs whites all while whisking the egg whites into a frenzy. Mix the water and the sugar together and put over the stovetop. If you have a candy thermometer, you will boil this mixture until 238 degrees F, or the soft ball stage. If you don’t, just watch the mixture – it will change consistency to be come glassy and slightly thicker. Remove from the burner. 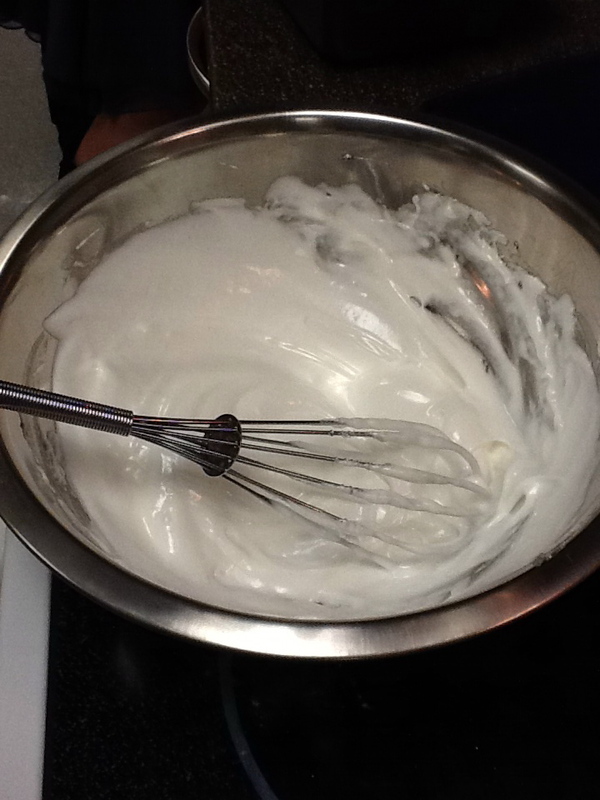 Grab the bowl with the whipped egg whites and prepare the whisk. One person should be in charge of whisking while the other carefully pours the syrup into the egg whites. If you are using an electric mixer, set the mixer on HIGH and hold the pot over your head while pouring in the syrup. The sugar must be added in a long, thin stream so as to prevent the egg whites from cooking given the temperature of the sugar (and the tendency for sugar to continue cooking even when removed from the eye). The mixture will thicken and turn glossy. Beat until warm to the touch. NB: BOILING SUGAR IS VERY HOT AND IF YOU BURN YOURSELF IT WILL BE PAINFUL. So please be careful. Add the marshmallow to the batter one third at a time, making sure that everything is well incorporated BUT not mixing too much – once everything looks uniform, stop mixing. Drop the batter one teaspoonful at a time onto a cookie sheet lined with parchment paper (or wax paper). 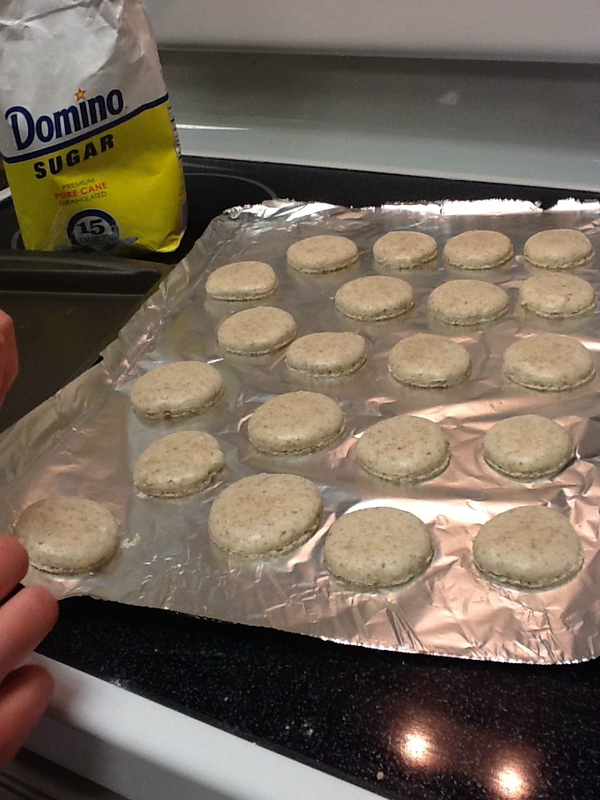 The macarons will stick if you do not line the cookie sheet. We used aluminum foil because we didn’t have anything else. We succeeded but I feel that parchment paper would be a better option. Allow the cookies to rest for 15 minutes before placing them in the oven. Cook them in a cool oven, about 315F for 10 minutes. Take them out of the oven and let them cool before attempting to remove them from the paper. They are very light and fragile, and will crack or break if manipulated while warm. This is how ours looked – we were lucky and they were smooth with a nice “foot” or the frilly/frothy edges. Now all that remains to do is fill them – we used chocolate ganache and caramel but anything goes. Common fillings include buttercream and jam/preserves.